Developed to combat 2 main biochemical and physiological mechanisms of wrinkle formation, our Youth Defense Complex is based on two innovative patented ingredients; Argireline and SNAP 8 with "Botox like" properties. This unique cream reduces the depth of the wrinkles that occur due to the natural physiological changes over time and those that are caused by the constant pull of gravity and contraction of the muscles of facial expressions. DuaLift is a breakthrough treatment for the Face & Neck. With its double-action and unique components, DuaLift helps the complexion cope with the harsh effects of environmental damage and the natural deterioration of skin texture and tone as we age. This newly developed cream is mainly based on the innovative NanoVit by Swiss Mibelle Biochemistry AG. NanoVit is produced from Hippophae extract which contains two essential components; Palmitoleic acid (Omega 7) which is known for its role in the cell rejuvenation process, and Carotene which is recognized as powerful antioxidant and the most important source of Vitamin A. This concentrated Serum gel is enriched with Whey Protein that is proven to fight against wrinkles and the formation of wrinkles. The Swiss ingredient Regu-Age is an innovative bio-engineered component that combines purified soy, rice peptides and yeast protein. Regu-Age contributes to the strengthening of connective tissue. Improving the firmness of the skin while protecting the collagen and skin elasticity and further helps prevent damage by UV and free radicals. 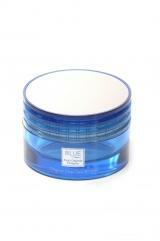 It is also used to help reduce dark circles and puffiness around the eyes. This powerful indulging cream contains high purity marine derived Collagen, MARI COLL N-30, which helps to improve the moisture content of the skin due to its film forming and moisture binding properties. It also serves as an anti-irritant agent, which helps to reduce irritation of the skin. The Multi Vitamin compound A, C, E, B5 with the UV filter creates a protective layer against oxidants, pollutants and harmful sunrays. Helps Whitening Brown Spots & Unifies Complexion. A newly developed product enriched with proteins and lipids, helps during the night to counteract the effect of excess Melanin - the main cause of brown spots and uneven complexion. It is based on the Nano-White . A highly active skin lightening complex developed by Mibelle AG Biochemistry, Switzerland. Nano-White contains a natural extract from Bearberry Leafs, a vitamin complex and anti-oxidants.